This chromolithograph is taken from plate 31 of William Simpson's 'India: Ancient and Modern'. 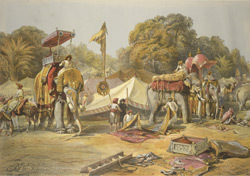 The royal elephants of the Maharaja Holkar are being prepared for a ceremonial ride by their mahouts or handlers. They are caparisoned with rich hangings and with decorative howdahs (seating platforms). State elephants wore cloth of gold, large anklets and had their faces painted bright colours.